There's not much more frustrating than your oven kicking the bucket right before the roast is supposed to be done. Don't worry: that's what we're here for. For reliable repair services that you can depend on, give us a call. Serving all of Cochrane's quadrants. From physical damage to faulty electrical components, our Cochrane Appliance repair services will get you cooking with confidence again. A broken fridge can spoil more than your evening. Let us keep your food safe and your family fed! Check out our Cochrane Appliance repair service. We’ll get your dishes clean, and we don’t mean by hand! You can be confident with our Cochrane Appliance repair service. As a locally owned and operated business, we have a personal interest in your satisfaction! We’re proud to be an appliance repair service in Okotoks, and willing to go the extra mile whenever and wherever we’re needed. Personalized Services Big Chains Can’t Match! 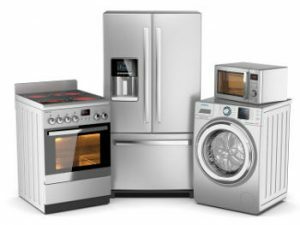 We know our way around household appliances which is why we are proud to offer our customers service warranties that they can count on. Before inviting us into your home or business, meet the technicians at Cochrane TechVill Appliance Repair Services. Learn more about us.